TNFα is a proinflammatory/antitumour cytokine that is indispensable to the inflammatory response. The TNF locus contains several polymorphic areas, including five microsatellite markers—a, b, c, d, and e—which contain 14, 7, 2, 7, and 3 alleles, respectively. These microsatellites are associated with different degrees of TNFα secretion, and are related to a greater susceptibility to developing autoimmune and infectious diseases. A recent study reported several associations between TNF microsatellites and cancer, among other diseases.2 However, up to now, the association of these markers with HPV and the progression to cervical intraepithelial neoplasia has only been studied by Ghaderi et al,3 who focused specifically on TNFa alleles. The objective of our study was to verify the frequencies of TNF microsatellite alleles (a–e) in 106 patients with HPV cervical infection and to compare these frequencies with the results from 101 healthy controls. In accordance with ethical norms, blood samples and cervical scrapings were collected from all patients at the time of their consultation. DNA was extracted from blood and scraped samples by the method of Higuchi.4 Primers and conditions for the polymerase chain reaction (PCR) have been described elsewhere.5,6 PCR products were electrophoresed on 12% denaturing polyacrylamide gels at 20 mA for TNF (a–e) and a 10% non–denaturing gel at 200 V for HPV; both gels were silver stained (fig 1). The allelic frequencies of the five TNFα microsatellite alleles were tested, for a total of 32 analyses (GENEPOP software; Population Genetics Software Package; M Raymond and F Rousset, http://wbiomed.curtin.edu.au/genepop/genepop_op1.html). No significant difference was found between the two populations (table 1). Among all the alleles, only TNFa*8 showed a significant association with HPV infection (χ2 = 4.79; relative risk, 10.73; 95% confidence interval, 1.28 to 89.9). Our present study is the first to analyse the association of five microsatellites (a–e) of the TNF gene with cervical HPV infection, irrespective of HPV type and lesion grade. According to our results, women carrying the TNFa*8 allele had a 10 times greater risk of being infected with HPV than did the control group. In contrast with data reported by Ghaderi et al,3 our analyses did not reveal an association between the TNFa*11 allele and HPV infection. Further studies are currently under way in our laboratory to determine whether the presence of specific microsatellites of the TNF gene are related to high risk HPV types or high grade cervical lesions. 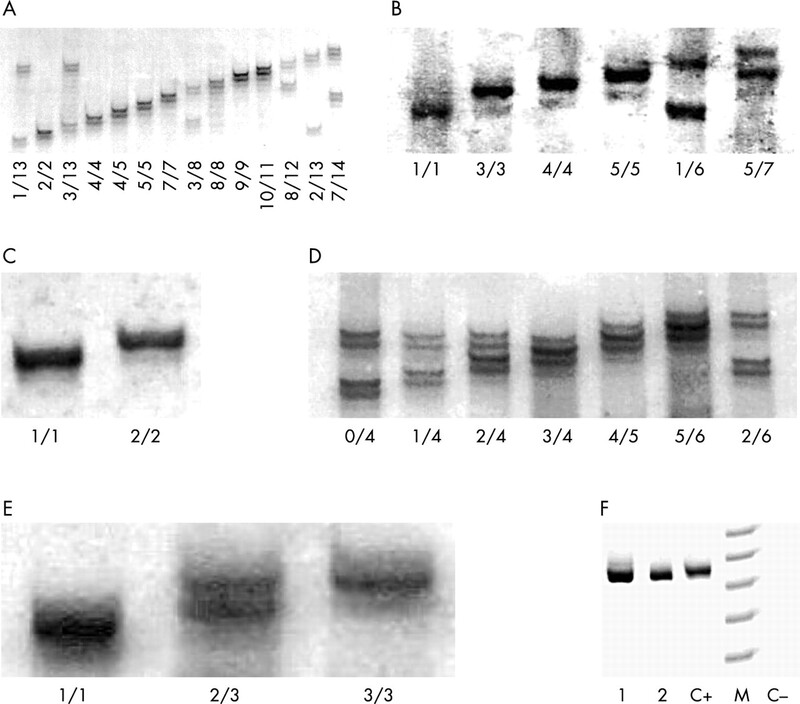 Polymerase chain reaction (PCR) analysis using electrophoresis on a 12% denaturing gel of (A) the tumour necrosis factor α a (TNFa) allele, (B) the TNFb allele, (C) the TNFc allele, (D), the TNFd allele, and (E) the TNFe allele. (F) PCR analysis using electrophoresis on a non–denaturing 10% polyacrylamide gel of human papillomavirus (HPV). Lane 1, patient number 1 (HPV positive); lane 2, patient number 2 (HPV positive); C+, positive control; C−, negative control; M, DNA molecular weight markers (50 bp). We thank Dr EA Donadi for help with revising this manuscript. This work was supported by FAPESP (n.00/12371–3) and CAPES (n. DS 103/00). Malejczyk M, Jozwiak J, Osiecka A, et al. Serum levels of soluble tumor–necrosis–factor receptors in patients with benign and malignant HPV–associated anogenital lesions. Int J Cancer1997;73:16–19. Hajeer AH, Hutchinson IV. TNF–alpha gene polymorphism: clinical and biological implications. Microsc Res Tech2000;50:216–28. Ghaderi M, Nikitina L, Peacock CS, et al. Tumor necrosis factor a–11 and DR15–DQ6 (B*0602) haplotype increase the risk for cervical intraepithelial neoplasia in human papillomavirus 16 seropositive women in Northern Sweden. Cancer Epidemiol Biomarkers Prev2000;9:1067–70. Higuchi R. Simple and rapid preparation of samples for PCR. In: Erlich HA, ed. PCR technology. New York: Stockton Press, 1989. Udalova IA, Nedospasov SA, Webb GC, et al. Highly informative typing of the human TNF locus using six adjacent polymorphic markers. Genomics1993;16:180–6. Manos MM, Ting Y, Wright DK, et al. The use of polymerase chain reaction amplification for the detection of genital human papillomaviruses. Cancer Cells1989;7:209–14.